LOS ANGELES (January 23, 2018) – “Clear your schedule for one of the best series of 2017”1 as season one of “THE HANDMAID’S TALE” comes to Blu-ray and DVD on March 13 from Metro-Goldwyn-Mayer and Twentieth Century Fox Home Entertainment. The 3-disc set also includes two brand new featurettes that take viewers deeper into the world of Gilead. Based on Margaret Atwood’s award-winning, best-selling novel, “THE HANDMAID’S TALE” is the story of life in the dystopia of Gilead, a totalitarian society in what was formerly the United States. Facing environmental disasters and a plunging birthrate, Gilead is ruled by a twisted fundamentalist regime that treats women as property of the state. As one of the few remaining fertile women, Offred (Elisabeth Moss; Top Of The Lake, Mad Men) is a Handmaid in the Commander’s household, one of the castes of women forced into sexual servitude as a last desperate attempt to repopulate a devastated world. 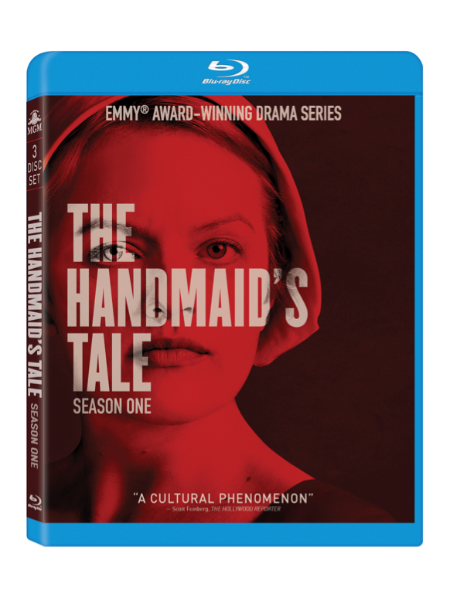 In this terrifying society where one wrong word could end her life, Offred must navigate between Commanders, their cruel wives, domestic Marthas, and her fellow Handmaids – where anyone could be a spy for Gilead – with one goal: to survive and find the daughter who was taken from her. “A magnificent and effectively haunting 10-episode series” (Hank Stuever, The Washington Post), “THE HANDMAID’S TALE” features outstanding performances from Moss, Joseph Fiennes (American Horror Story – Asylum, Shakespeare in Love), Yvonne Strahovski (Chuck, Dexter), Alexis Bledel (Gilmore Girls), Madeline Brewer (Orange is the New Black), Ann Dowd (Compliance, The Leftovers), O.T. Fagbenle (The Five), Max Minghella (The Mindy Project) and Samira Wiley (Orange is the New Black). “THE HANDMAID’S TALE” is created for television by Bruce Miller (The 100), who serves as the series’ showrunner. The critically-acclaimed series is executive produced by Miller, Warren Littlefield (Fargo), Daniel Wilson, Fran Sears and Ilene Chaiken. “THE HANDMAID’S TALE” is produced by MGM Television and internationally distributed by MGM. From Script to Screen: Go inside the premiere episode’s “Salvaging”, a harrowing scene where Handmaids violently participate in the execution of an alleged attacker. Interviews with series Showrunner/Executive Producer Bruce Miller, Elisabeth Moss, Ann Dowd and Madeline Brewer, as well as an in-depth look at the story points, character arcs and complexity of shooting this sequence with Director of episodes one through three, Reed Morano. Hope in Gilead: Examine the reasons why “THE HANDMAID’S TALE” has captivated millions and become a cultural phenomenon. The cast and crew discuss parallels with today’s political climate as well as the series’ themes of hope, resilience and the fight for freedom.